BleachHouseLibrary.ie: "Demon Road" by Derek Landy. Review from Mia, aged 12. "Demon Road" by Derek Landy. Review from Mia, aged 12. This book is about a sixteen year old girl named Amber. She lives a normal life, in a normal house, with a normal job and normal parents. At least, she thinks her parents are normal. When two rude guys attack her, it changes her life forever. 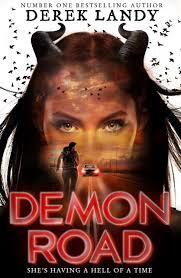 She becomes a red-skinned, horned demon and then figures out her parents and their friends demons too. And, they are out to kill her. When Amber is sent off with a complete stranger on a drive around America, she has no idea what's going on. She makes a deal with a demon from Hell and she only has 504 hours to find a person who's name she doesn't know, or else she dies. During the journey, Amber meets an Irish guy called Glen who has a similar predicament to hers and he tags along. On their mission, Amber, Glen and the driver, Milo, battle off vampires, more demons and winged beasts. But will they survive driving across the Demon Road? This is an amazing book by Derek Landy, one of my favourite authors. I read it in three nights! I love his Skulduggery Pleasant novels as well. I find Derek's work a great way to get people reading.